This noted Chicago attorney and socialite was the nephew or renowned architect Daniel Burnham and the husband of influential American Impressionist artist Anita Willets-Burnham (1880-1958). ALS, 1p, 6½" X 9½", Winnetka, IL, 4 July 1939. Addressed to David C. Hannah. Very good. Faint folds and mild bit of wear, but boldly penned in black ink. Returns (not present!) "a dollar for the one you were kind enough to lend me the other day" and sends (also not included) a self-published book, "a complimentary copy of some of my Kiddish Rhymes -- you may have seen some of them before...." Interestingly, the street address Burnham pens at top -- "1407 Tower Road" -- was one of the oldest houses in this toney suburb north of Chicago, a circa 1820 log cabin his wife found in 1914, purchased and moved to this location, transforming it into a home and artist's studio (today owned by the Winnetka Historical Society). This lawyer and jurist, son of noted jurist and commissioner of New York's Central Park Richard M. Blatchford, served on the U.S. Supreme Court from 1882 to 1893, and was known as a specialist in maritime and patent law. Boldly penned "Yours very truly / Saml Blatchford" in brown ink on a corner-clipped 4 3/4" X 1½" lined slip clipped from a letter, at the top of which is neatly affixed a 4½" X ½" slip clipped from the top of the same letter, reading (in Blatchford's hand) "New York Septr 18th 1882." Very good. Bit of brownish glue messiness where the two slips are joined, else a nice example dated just six months after his appointment to the Supreme Court. One of the best known attorneys in late 19th century New York City was this powerhouse district attorney, who was named to the New York Supreme Court in 1902. ANS, 1p, heavy stock 3" X 1½", n.p., n.y. Fine. On his elegant imprinted "Mr. Vernon Mansfield Davis" calling card, Davis crosses out the "Mr." and boldly pens "Mrs. Davis joins me / in thanks and / appreciation of good / wishes -- Sincerely / Vernon M. Davis." Also present is the tiny 3¼" X 2½" mailing envelope addressed in Davis's hand to Mr. and Mrs. John Barker and bearung 2-cent postage stamp. Very good. A black-bordered mourning envelope, undated but likely a condolence acknowledgment either for the death of Davis's mother in 1912 or his father in 1913. Accompanied by a second, pristine, unsigned calling card. Unusual! 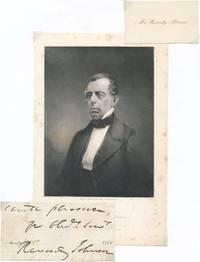 This Maryland attorney took on high profile cases such as that of Sanford in the Dred Scott case, General Fitz-John Porter in his court martial trial after Second Manassas and Mary Surratt the alleged Lincoln assassination co-conspirator; as a statesman he served Maryland in the Senate (1849-50, 1863-68) and acted as Zachary Taylor's Attorney General (1849-50) and as U.S. Minister to Great Britain (1868-69). Inscription and signature clipped from letter on a 4½" X 2¼" slip, n.p., n.y. [pencilled note on verso states Baltimore, 1865 June 24]. Very good. Faint age toning; mounting traces on verso. A large and bold "with pleasure, / yr obdt. servt / Reverdy Johnson" in brown ink in Johnson's usual hurried, sloppy script. (Another hand inks a miniscule "Senate Maryland 1865" above his signature.) Accompanied by a fine example of Johnson's 3" X 1 3/4" buff heavy stock calling card with "Mr. Reverdy Johnson" in italic typeface at center and also a 5 3/8" X 8½" steel-engraved head-and-shoulders portrait of Johnson in later years, undated but accomplished while Attorney General, thus circa 1850. Very good. Lightly age toned, with a bit of foxing. A fine trio. The son of noted Baptist minister Rev. Horatio G. Gates (1777-1853) was a Pennsylvania attorney and state senator known as an advocate of religious liberty; an antiquarian at heart, he long served as foreign corresponding secretary of the Historical Society of Pennsylvania. Partly-printed DS, 1p, 7 3/4" X 9 3/4", Philadelphia, PA, 1852 November 8. Very good. Strong original folds (not weakened); mounting traces on verso. 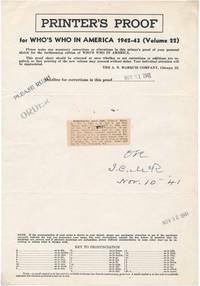 Attractive partly-printed document with large circular seal of this organization at top. Notifies Major G.H. Crossman that at the organization's November 8th meeting he was named an honorary member. Blank portions filled in by Jones in brown ink with his bold, interesting script. Large bold signature at the close. This huge corruption investigation of the 1980s involved the FBI, IRS, USPS, Chicago Police Department and other law enforcement agencies and resulted in a large number of indictments and convictions of judges, lawyers, sheriffs, police officers and court officials -- among the top of which was this federal judge, convicted of extorting $200,000 in "loans" from those under him; his 18-year sentence was later reduced to 13 years and he was released in 1990. TLS, 5pp (rectos only), 8½" X 11", Oxford, WI, 1987 December 29. Addressed to Aaron Cohodes. Very good. Two faint original fold lines and 3/4" edge tear at right margin. Writing from prison, Holzer congratulates this Chicago publisher on his success, then boldly states: "...allow me to introduce myself. I am a prisoner at the Federal Prison Camp, Oxford, Wisconsin." Interestingly, when Holzer was sentenced for his crimes, he remarked, 'I stand before you a convicted felon, exhausted, disrobed and defeated. ... I have committed crimes. Those crimes have destroyed me. They have wounded my family beyond measure and confused my friends. ... There are no words to express my loss, my remorse, my grief.'' But in this letter he recaps his career, then paints Operation Greylord in a different light: "I became, in 1985, one of more than seventy judges, lawyers and court personnel to find himself the target of a wide-ranging investigation, tagged 'Operation Greylord' by the prosecutors and press, followed by the inevitable indictment.... after a newsy, six-week trial, I was, of course, found guilty on most counts. In the media-hyped atmosphere of the day, a finding of innocent would have been impossible...." The remainder of this lengthy letters is not a legal expose ("but I'm ready to take on that assignment next"), but rather a description of his novel "Leviticus 18" -- "the story of a Jewish family who lived in the town of Oswiecim, Polish Austria-Hungary, nestled in the foothills of the Carpathian Mountains, about thirty-five miles west of Krakow. The action occurs roughly between 1880 and 1910...." Interesting and unusual, with direct reference to the scandal that ruined his career. The older brother of noted Chicago businessman Herman Kohlsaat was a noted jurist -- serving as probate judge for Cook County (1890-99), appointed by President McKinley to the U.S. District Court for the Northern District of Illinois in 1899, finally elevated by Theodore Roosevelt to the U.S. Court of Appeals for the Seventh Circuit in 1905. ALS, 1p, 5 3/4" X 9¼", Chicago, IL, 1890 January 21. Addressed to noted Illinois jurist William G. Ewing (1839-1922). Very good. Faintly age toned. Boldly penned in lined stock with "Law Offices C.C. Kohlsaat" and Chicago address imprinted at upper left, Kohlsaat writes the U.S. District Attorney this effusive letter of thanks, apparently after his first appointment as probate judge. "Please accept my sincere thanks for your warm words of Congratulations. I had no reason to expect such friendly action from you. It is therefore the more Grateful. In writing to the Governor, you performed a very delicate service...." -- which suggests that it was Ewing who suggested Kohlsaat's appointment to the Governor Joseph W. Fifer. This English-raised American attorney served as the 14th U.S. Attorney General under Martin Van Buren, and presented the government's side in the controversial Amistad case. Large, bold signature in brown ink on a 3" A 1" slip, n.p., n.y. Very good. Faint age toning; lightly tipped to slightly larger sheet. Accompanied by a modern 8½" X 11" reproduction of a steel-engraved head-and-shoulders portrait of Gilpin. This conservative jurist served as 15th Chief Justice of the United States (1969-86), replacing Earl Warren. TNS, 1p, 7¼" X 9½", "Supreme Court of the United States" letterhead, Washington, DC, 1986 February 6. 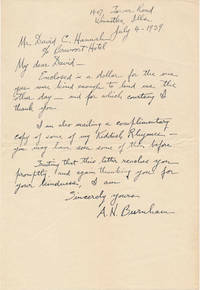 Addressed to Ralph G. Newman (1911-98), founder of Chicago's noted Abraham Lincoln Book Shop. Near fine. 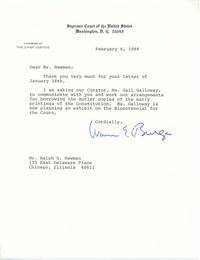 Newman must have been curating an exhibit of some sort, for Burger writes: "I am asking our Curator... to communicate with you and work out arrangements for borrowing the Butler copies of the early printings of the Constitution...." With original envelope. This member of the legendary early colonial Philadelphia family was a famed attorney and sociality of that city, active in such organizations as the American Philosophical Society and the Pennsylvania Board of Charities. ADS, 1p, 5¼" X 6½", Long Branch, NJ, 1876 July 3. Very good. Minor soiling. 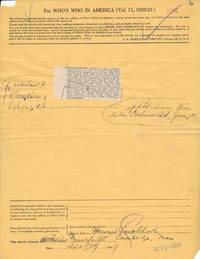 Payment order boldly penned in brown ink: "The Bank of North America Phila will please pay to the order of S.A. Howland One Hundred and nine 10/100 dollars...." Signed in full. Oval "Paid" inkstamp at lower right, not affecting written portion, and partial tax stamp at lower left, plus the usual cancellation slashes. Interesting and unusual. One of the most highly regarded attorneys in the U.S. was this Massachusetts lawyer, who was appointed to the Massachusetts Supreme Bench in 1865, where his reputation as a formidable jurist increased; committed suicide with a revolver, but whether it was a Colt we do not know. ALS, 1p, lined 5¼" X 8¼" lettersheet, Boston, MA, 1874 October 6. Addressed to "Col. Lathers" -- surely Richard Lathers, 1821-1903, noted Charleston and later New York merchant, banker, diplomat, and insurance and railroad executive. On stationery bearing a blind-embossed heading of "Tremont House / Boston" (Boston's famous and pioneering hotel), Colt pens a friend in his sloppy scrawl. In part: "How I should like to dine with you these October days -- & especially on the last day of [ ? ] show, that best of all holidays in the year. Sorry not to have your address on agriculture sorry to be held up here But so it is...."
The only son of the famed politician and orator was a noted attorney, U.S. District Attorney in Arizona (1915-20) and Collector of Customs for the port of Los Angeles (1938-53). ANS, 1p, 7¼" X 10½", n.p., 1931 December 4. Addressed to Henry T. Rainey (1860-1934, Illinois congressman). Very good. Paper clip stain at upper left, else clean and nice. On personal letterhead, Bryan notes, "I was much interested in the enclosed clipping from one of our local papers. Especially in what you have said regarding silver and the tariff question. You may be interested in the enclosed copy of a speech I have been making on these subjects...." Alas, neither of these mentioned enclosures is present. This jurist served briefly as attorney general (1913-14), but is best remembered for his long stint as Supreme Court associate justice (1914-41) and attorney general under Wilson (1913-14). Partly-printed DS (initials), 1p, 7" X 10½", Washington, DC, 1941 November 10. Near fine. "Printer's Proof" for McReynolds' entry in the 1942-43 edition of "Who's Who in America," initialed, dated and OK'd by McReynolds. An interesting and unusual mini-biography. This New York Supreme Court Justice is remembered for the date of September 20, 1881 -- when he went to a residence at 123 Lexington Avenue in New York City to swear in Chester A. Arthur upon the death of James A. Garfield. Clipped "and present my thanks. / Yrs very respy / Jno. 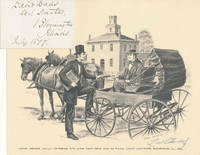 R. Brady / Mr. Burnham," 5¼" X 2¼", n.p., n.y. Very good. Minor mounting traces on verso. Top text line slightly trimmed. Bold and attractive -- a quite nice example. Popular Michigan politician and senator (1943-1954); ambassador to the Philippines. Signature and title ("Judge US Court of Military App. / Washington, D.C.") with date (1967 May 17) on a special heavy stock 5" X 3" card. Fine. With original envelope. Accompanied by a choice, original vintage 10" X 8"news agency photograph (International News Photo). Near fine. Issued in 1947, this informal glossy shot depicts eight "weary, but smiling" legislators walking down the steps of the Capitol building, among them Ferguson, Claude Pepper, John Sparkman, Howard McGrath and other noted politicos of the day. Printed caption notes, "The 80th Congress Ended Its History Making First Session Today, Finally Adjourning at 3:49 AM EDT, More Than Three Hours After the House Had Quite to Go Home...." Itself a scarce and desireable image. This attorney general under Truman was appointed to the U.S. Supreme Court in 1949, where he served until 1967. TLS, 1p, 7" X 9", Washington, DC, 1948 February 18. Addressed to Judge Edward J. Turnbaugh. Very good. Two file holes at top margin. On Attorney General letterhead, Clark regrets at length that he cannot give the keynote address at a Youth Guidance Training Institute. Austrian-born associate justice of the U.S. Supreme Court (1939-62); helped found American Civil Liberties Union. Partly-printed DS, 1p, 8½" X 11", Cambridge, MA, 1919 September 29. Very good. Slight smearing of signature. Small chips at two corners, not affecting text. 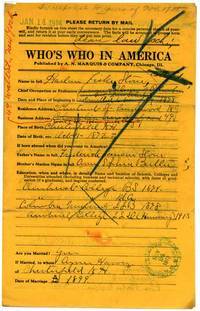 Updating form sent out by "Who's Who in America" for its 1920-21 edition, on light orange paper, with Frankfurter's 3" X 1½" biographical entry from the previous edition affixed onto the blank center area. Frankfurter has written in two small additions ("assistant to the Secretary of Labor" and "appt'd. chmn. War Labor Policies Bd., June, 1918"), signing and dating it at the bottom. Several editor's marks and corrections in purple ink. Comes with a fine -- and itself scarce -- 1947 news agency photograph (International News Photo) of a seated Frankfurter (feet not touching the floor! ), along with Bernard Baruch and others, receiving an honorary degree from City College of New York. Original mimeographed caption sheet present. This one-term wonder New York representative (1815-17) distinguished himself in jurisprudence, rising from the U.S. Army JAG corps to district attorney (1821-23) to New York State Supreme Court circuit judge (1823-26) to U.S. District Court of the Southern District of New York federal judge (1826-67). ALS, 1p, 7½" X 9½", Bloomingburgh, NY, 1815 August 11. Addressed to L. Jenkins, an attorney in Albany. Very good. Interesting if somewhat cryptic letter regarding the case of Daniel Niven vs. Israel Gibbs. In part: "...will you examine the minutes of this Term & see what the judgt. of the court is.... I wish two certified copies of the bail piece in the above cause, to be processed & addressed to me by mail, without delay... I wish to get the bail piece back to Albany... in time to have one of the Judges endorse the exoneretur [sic] this Term...." An attractive piece, penned as a young man just prior to entering Congress, and worthy of further research. The dean of Columbia Law School went on to serve as attorney general under Coolidge before joining the U.S. Supreme Court, as associate justice (1925-41) and chief justice (1941-46). Partly-printed AMS, 4pp, 5 3/4" X 9¼", Englewood, NJ, 1913 November 24. Very good. "Who's Who in America" questionnaire, filled out entirely in Stone's hand, starting with full name, occupation, address, birthdate, and going into education, marital status, professional associations, clubs, etc. Most printed questions bear brief responses, and a few (namely military record and list of books written) did not apply and were left blank. Truly unique, a fascinating and exceptionally early biographical record by the future chief justice. Accompanied by a striking 6" X 8" steel engraving of Stone. Fine.